Tree Theme Address Sign - - custom made address plaque for your home or business. 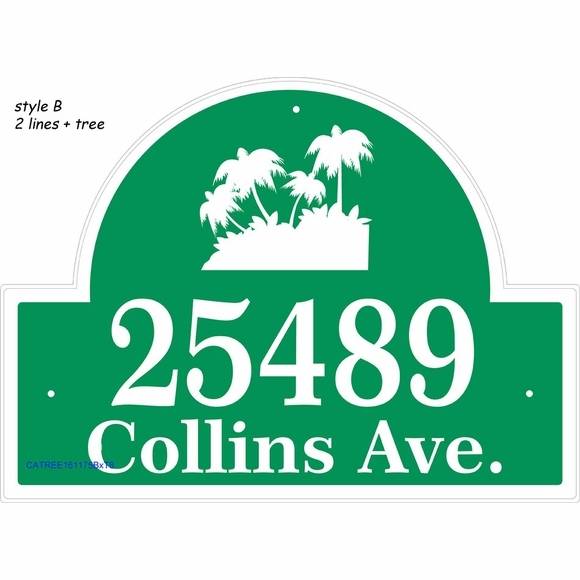 Personalized for tree lovers with a tree image above the street address. Made in the USA. Tree assortment includes fir, deciduous, palm, and bonsai trees. This wall mount arch sign can be set up with a one-line or a two-line address. Style A, the one-line sign, holds up to five (5) 4" numbers or eight (8) 3.5" numbers and the tree you select. Style B, the two-line sign, holds up to five (5) 3.5" characters on Line 1, twelve (12) 1.5" characters on Line 2, and the tree you select. 16" x 11.75" arch address sign made from sturdy and UV-stabilized laminated acrylic. Eight vivid color combinations: sky blue with white characters; black with white characters; white with black characters; brushed gold with black characters; brushed stainless with black characters; red with white letter; kelley green with white characters; and yellow with black characters. Personalized address sign for your residence or business contains a tree theme logo inside the arch.